chemotherapy’s effect on hair and what hair options are available for cancer patients. 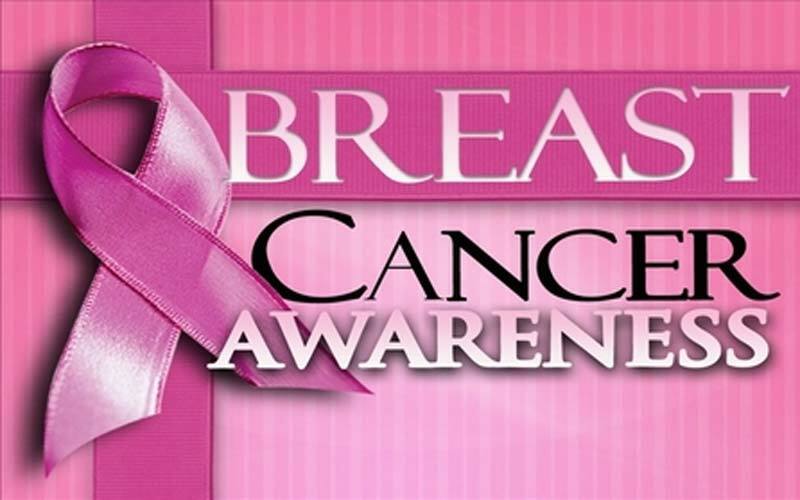 What is National Breast Cancer Awareness Month? National Breast Cancer Awareness Month (NBCAM) is an annual national and international health campaign sponsored by major cancer and medical charities and associations every October to increase awareness of breast cancer, as well as raise money for research into breast cancer’s prevention, diagnosis, treatment, and cure. Additionally, the month-long campaign provides support and information to those affected by breast cancer. National Breast Cancer Awareness Month began in 1985 as a partnership between the American Cancer Society and the pharmaceutical division of Imperial Chemical Industries (now part of AstraZeneca), maker of several breast cancer drug treatments. Originally, the aim of the campaign was to promote mammography as the most effect weapon against breast cancer. With the foundation of the Breast Cancer Research Foundation in 1993 by Evelyn Lauder, the Senior Corporate Vice President of the Estée Lauder Companies, the pink ribbon was adopted as the National Breast Cancer Awareness Month’s symbol. What Foundations Support Breast Cancer Research and Awareness? Water can dramatically change the way our hair looks and acts. The structure of wet hair feels and acts different than dry hair. When wet, hair appears to be longer, heavier and smoother. But what are the actual physical changes between wet and dry hair? Hair is permeable, meaning it allows water to pass through it. This permeability allows hair to absorb large amounts of water. Healthy hair can absorb over 30 percent of its weight in water. Damaged hair can hold even more, allowing for up to 45 percent of its weight in water. This water absorption leads to swelling in the hair shaft. When wet, hair’s diament can swell 15 to 20 percent. The heaviness of wet hair is a result of the water absorbed by the hair. Wet hair also allows for greater elasticity. When healthy hair is wet, it can stretch in length by up to 30 percent, while still being able to return to its original length after drying. This increase in elasticity is why your hair appears longer when wet. However, stretching your hair too much when wet can lead to damage and possibly breakage. 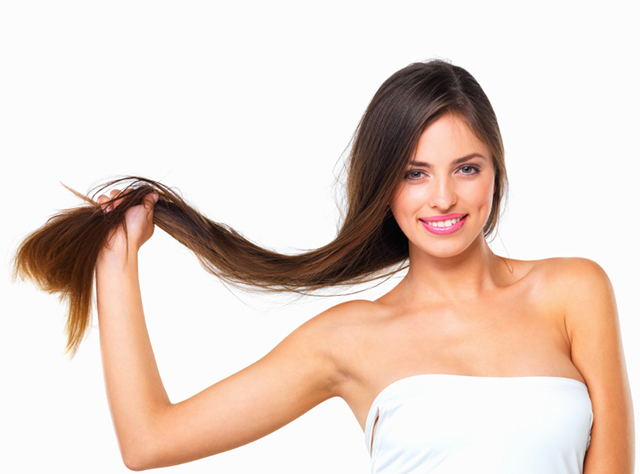 When hair is stretched over 30 percent of its original length, permanent damage begins to occur. Hair stretched 80 percent of its length will fracture. Due to its greater elasticity, wet hair is more sensitive than dry hair. Wet hair has a higher combing friction than dry hair, making it more susceptible to damage. Combing wet hair is more likely to stretch already brittle hair beyond its breaking point. Different types of water have different effects on hair and hair structure. Prolonged exposure to saltwater can dry out hair, leaving your hair brittle and rough. Saltwater damage can cause the ends of hair to split and break. Water with chlorine can strip hair of its natural lubricant, leaving hair dry and porous. Hard water can also affect hair structure. 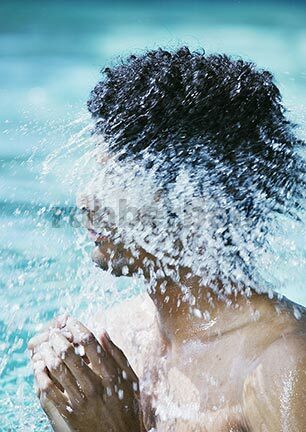 Hard water contains a large amount of minerals, such as calcium and magnesium, which can build up on the hair and scalp. Prolonged use of hard water can leave hair feeling dry, brittle and weighed down. When hair is wet, its structure and feel change. Water causes hair to be heavier, more elastic and more sensitive. Due to the increased sensitivity of wet hair, it is important to be gentle with your wet hair. Wet hair is at a greater risk for damage and breakage. How many strands of hair do humans typically possess on their heads? We all know at least a few people that are balding or have thinning hair. These observations have probably raised a question or two for you about the typical number of hairs on someone’s head. How many hairs does the average human possess on their head? Does that number change depending on what color hair they have? How many hairs do they lose over the course of a few days? Well, here we’ll discuss some of the answers to those questions and hopefully encourage you to have a conversation with your stylist at the same time. As far as how many hairs are on a person’s head, typically, humans average between 90,000 and 150,000 hairs. Why such a large gap? Well, the number of hairs on your head depends on the number of hair follicles that your scalp contains. The average person has up to 150,000 follicles, but the number on your particular head is hereditary. That means that you inherited the amount of hair on your head because you inherited the number of follicles in your scalp. The number of follicles also stays constant throughout your life, so even if you begin balding, you aren’t losing those follicles. They just aren’t producing strands of hair anymore. The number of hairs on a person’s head also depends upon that person’s hair color. Hair color and number of follicles are both inherited traits, and generally speaking, blond people have smaller diameter hair and more follicles than people with another hair color. Blonds average about 145,000 hairs on their heads, while brunettes average around 108,000. Black and red hair strands are often thicker and more dense, so people with these colors of hair average lower than blonds and brunettes. Black hair averages around 100,000 strands, and red hair averages around 90,000. Of course, variance in hair diameter and density will vary from person to person, but the reasoning for the general occurrence makes sense. Blond hair has much lower levels of pigmentation, so the strands are thinner, so more hair is needed to cover and protect the scalp. The opposite is true for those with darker colored hair. Any tips from your stylist about maintaining healthy strands will help you protect your hair. The hair on your head is constantly in a cycle, and at the end of the resting phase, you’re hair will fall out. As new hair is produced within the follicle at the beginning of the growing phase, the old hair is pushed out, thus ending the the resting phase for that hair. The hairs on your head can last between two and six years, but because you have so many hairs, approximately 90% of your hair is in the growing phase at any given point in time. However, the average person loses between 50 and 200 hairs throughout each day. You can ask your stylist about ways to strengthen your follicles, but you shouldn’t be worried about this natural hair loss and regrowth. While your hair color and parent’s genes may determine the number of hairs on your head, you can be pretty sure that your number and color combination are totally unique. Here we provided a little bit of insight into the averages across many people, but it’s up to you to talk with your stylist about the right way to approach maintaining the health of your hair. Where is Keratin found? An infographic brought to you by Benoté Salon! As you grow, your hair goes through a cycle of growth and loss and regrowth. Human hair is random, not seasonal or cyclical like other mammals. At any given time, hair will be at one of three growth stages, with every hair at a different stage. To first understand the growth stages of hair, we should look at what makes up our hair. There are two distinct structures to hair: the follicle and the shaft. The hair follicle is a tunnel-like segment of the outer layer of skin that extends down into the second layer of skin called the dermis. At the base of the hair follicle is the dermal papilla which contains tiny blood vessels that provide nourishment to the cells. Surrounding the papilla is the bulb, the living part of the hair. The cells of the bulb divide faster than any other cell in the body, dividing every 24 to 72 hours. Two sheaths surround the hair follicle, an inner and outer sheath, which protect and form the growing hair. The hair shaft is made of keratin, a hard protein, and is composed of three layers. The inner layer is medulla, the middle layer is the cortex and the outer layer is the cuticle. The cortex makes up the majority of the hair shaft and holds the hair’s pigment with the medulla. The first stage of hair growth is referred to as the anagen phase. The anagen stage is the growth phase, usually lasting between two to eight years. During this stage, the growth cells in the papilla rapidly divide, producing the hair shaft which becomes keratinized as it pushes up and out of the follicle. During the same time, the follicle grows down deeper into the dermis to get nourishment. People with long anagen growth rates are able to grow longer hair than those with shorter anagen phases. Approximately 85% of all hairs are in the growth phase at one time. Following the anagen phase, the hair goes through a transitional stage, referred to as the catagen stage. This stage usually occurs over a brief two to four weeks. During the catagen phase, the hair follicle shrinks and breaks away from the dermal papilla. As the hair follicle separates from the papilla, the bulb detaches from the blood supply and the hair shaft is pushed up as the follicle disintegrates. About three percent of all hairs are in this stage at any given time. 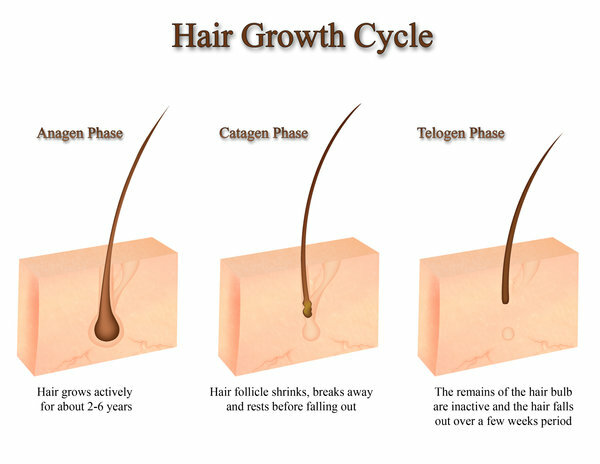 The follicle then goes into the resting phase known as the telogen stage. The telogen phase lasts from two to four months, during which the hair does not grow, but remains attached to the follicle. In this phase of hair growth, the follicle and the dermal papilla below are completely at rest. Approximately 10-15 percent of all hairs are in the telogen phase at one time. As the resting phase comes to an end and new hair is formed, old telogen hairs are pushed out and lost. About 50-100 telogen hairs are lost at this time due to the growth process, which is considered normal hair shedding. Once the telogen phase ends, the hair growth cycle is complete. Hair will go back into the anagen stage and the process begins again. It is SHOCKING to see how many women aren’t truly happy with their hair!! …. my heart sank a little. It shocks me, even in this business. We (Benoté salon) are so used to seeing women leave happy and empowered that we tend to forget how many others are either stifled or misinformed when it comes to healthy hair care. “According to a survey conducted by Dove, only 7 percent of women in the United States love their hair. The project also surveyed 1,000 U.S. women to find out how much they loved their hair. Sadly, not many. Hair Care is a higher priority in a woman’s morning routine than eating breakfast (45% versus 41%), applying makeup (39%) and extra sleep (35%). When asked how many hair products they use on an average day to manage/tame their unpredictable hair, 58% of women said they use three or more. 1 in 5 women have passed on a social event as a result of unpredictable hair. LADIES…. this poses the question… DO YOU LOVE YOUR HAIR? Aside from hair, where else is keratin found? Keratin is the protein that gives hair strength and rigidity, but it is also found all throughout the human body. It is actually the key structural material for both the outer layer of your skin and your fingernails and toenails. In fact, approximately 90 percent of the cells in your outer layer of skin are filled with keratin. Your epidermis, the outer layer of skin, is virtually waterproof and helps protect your body from infection, as well as regulating your body temperature. The reason that your skin is so strong is that the majority of your epidermis’ cells are keratinocytes. These are cells that are filled with keratin, which acts as a pathogen fighting protein that hardens as it builds up. The cells die and come off, which we know as dead skin, but they are constantly being replaced. The hardening of these cells is known as cornification, and constant abrasion causes a thickening of this cornified skin. These are the calluses that help us resist pain and extreme temperatures upon contact. Without this helpful layer of keratin infused cells, our immune systems would need to fight much harder to keep us healthy. 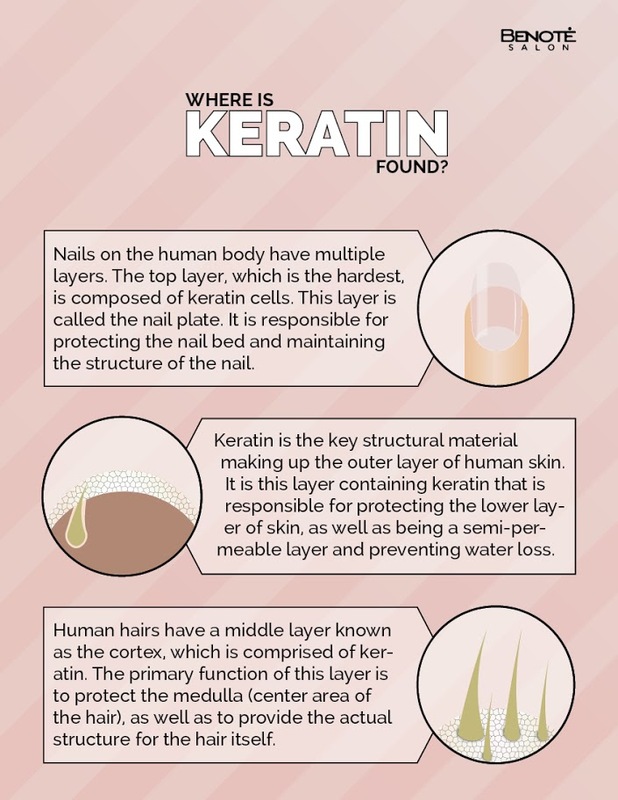 Keratin also gives us healthy, strong fingernails and toenails. However, the human nail is much more than just the nail plate to which we often refer. The matrix of the nail is the tissue which the plate protects. This tissue contains nerves and veins that transport signals to the brain, blood and other fluids. It is also responsible for producing the translucent keratinocytes that make up the nail plate. As new cells are formed, they push against the older cells, compacting and creating a strong but flexible plate. The nail bed is the skin surrounding the matrix, and like all skin, contains keratin infused cells, as well. A healthy nail helps us protect our fingers and toes from injuries, as well as giving us more precise motor function and increased sensitivity in the fingertips. Without keratin, our hair would have not strength, our skin would be much more prone to infection and disease and we would not have the security and sensitivity in our hands and feet that we do. This crucial protein protects our entire body, so don’t forget to ask your salon stylist about any tips that will help you keep your hair, skin and nails healthy. 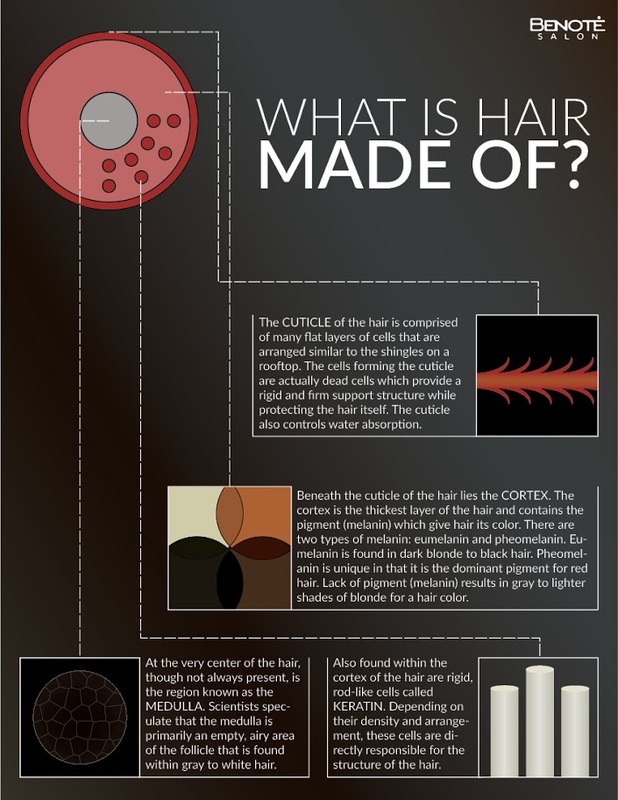 What is hair made of? You may be familiar with your hair, what shampoos and conditioners you should use and your favorite type of styling products, but do you really even know what makes up hair? While each strand of hair is a rather simple structure, the makeup of hair is interesting and complex. Each strand of hair has three layers. These are the cuticle, cortex and medulla. The cuticle is the outer layer made from overlapping keratin scales. Keratin is a strong protein, and these scales act as shingles on a home, protecting the inside from the elements. The cuticle is also covered with a molecularly small lipid layer which protects the hair from water. The middle layer of each strand is called the cortex. The cortex is the primary source for structural support and water uptake. Approximately 91% of your hair is made from protein in the form of long chains of amino acids, and these chains are found within the cortex. This is also the area of each strand of hair that contains melanin, the pigment that affects hair color. The amount of melanin in each cortex is determined by genetics, and as you grow older, the melanin concentration depletes, causing your hair to turn gray and white. The medulla is the core of a strand. This innermost region of the hair is not found in all hair types. For example, very thin hair or very light hair generally does not contain a medulla, but it is almost always found in very coarse hair. This means that some people may have strands of hair that only contain two layers, because the essential aspects to healthy hair growth and life are within the cuticle and cortex. Each shaft of hair that you see extends below your scalp into the hair follicle. The part of the hair that is within the follicle is the hair root. New cells are formed and nutrients are received at the hair bulb, which is the round end of the hair root at the base of the follicle. These new cells mature through a process known as keratinization, which is where the protein hardens, and the new cells push the older cells up and out of the follicle, causing your hair to grow. The shape of each strand of hair is determined by the shape of the hair follicle, which you can learn about in the “Not all hair is created equal” blog. Regardless, each hair strand consists of the same proteins and nutrients. Now that you know a little about how your hair grows and its makeup, you might can more easily understand why your favorite hair care products work for you. Make sure to discuss with your stylist any question you might have regarding keeping your hair healthy and yourself happy. … in the past you may have experienced Salons that are catered only to women… but Benoté doesn’t discriminate. In fact, our stylists aim to be skilled with both genders, all hair types, and all hair colors. There is nothing we can’t do! 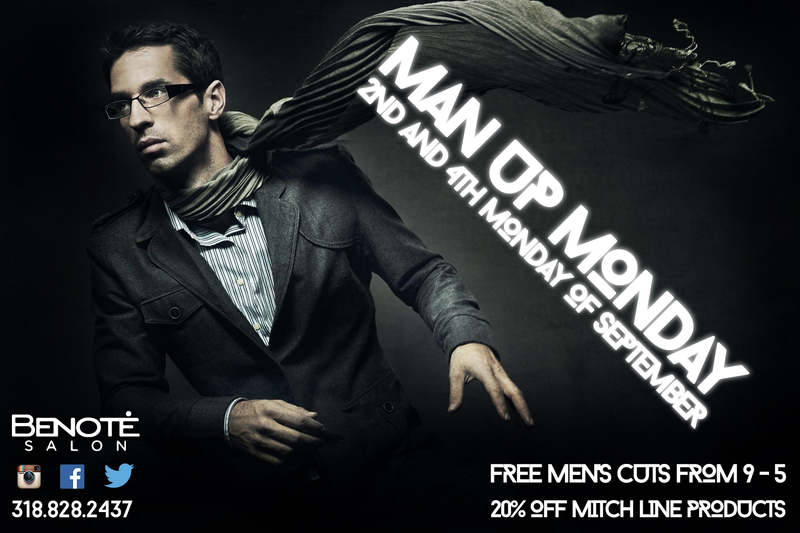 So when you get your next cut in September, remember to visit us on Youree Drive in Shreveport. Is there a safe alternative to using Ammonia based hair products? Hair stylists long believed that ammonia was absolutely necessary to artificially color hair with lasting results. Ammonia is a harmful chemical that damages hair and leaves it dry and unhealthy. However, natural, more gentle solutions have grown in popularity in recent years. Herb UK, A small company in England, has produced an organic solution to hair coloring that has been available in the US since 2002. It is known as Organic Color Systems (OCS) and is available in a range of 65 colors. The base of OCS is alkaline, which raises the pH of the hair, allowing color to enter, but it also conditions and softens hair. It does not destroy the tyrosine, which creates the melanin that give your hair its natural color, in the cuticles of the hair, so the artificial coloring can bond to it and remain vibrant over time. Not only is the active compound monoethanolamine safer and less damaging, it is also odorless. This means that your salon visit will be much more pleasant, and your hair will be much easier to style and keep healthy. L’Oreal Professionnel has recently entered the non-ammonia game, as well, with their INOA (Innovation No Ammonia) coloring system. An oily mixture containing dye molecules and monoethanolamine is applied to dry hair where the dye bonds with the moisture within each cuticle and escapes the oily substance. This allows the hair to be colored and conditioned at the same time. The vice president for marketing at L’Oreal, Peter Schiraldi, says that INOA delivers “vibrant color, great coverage and maintain[s] the condition of the hair prior”. This is really important because L’Oreal has the potential to inform and educate their vast audience of women about the importance of non ammonia based dyes. These natural and gentle hair dyes present a very compelling alternative to ammonia based treatments. With the added benefits of softer, healthier hair and an odorless application, before long, non ammonia treatments will be the norm for salons across the country. The next time you visit your stylist, ask about non ammonia hair dyes and the benefits to your hair and health. If you plan on having the color of your hair changed the next time you visit a salon, make sure to talk to your stylist about the chemicals involved. Many hair dyes and hair dying techniques rely on ammonia to open up your shafts of hair to allow different colors to permeate the hair. Recently, however, the producers of hair care products have started moving away from using ammonia, a dangerous chemical, as an ingredient. The primary role of ammonia in dye is to open the cuticle layer of hair to allow for new pigmentation. The pH of the hair is increased by the ammonia and the cuticle swells according to how much ammonia is in the dye. Another function of the ammonia is to neutralize your hair’s natural pigments. This is accomplished by mixing the ammonia with peroxide. 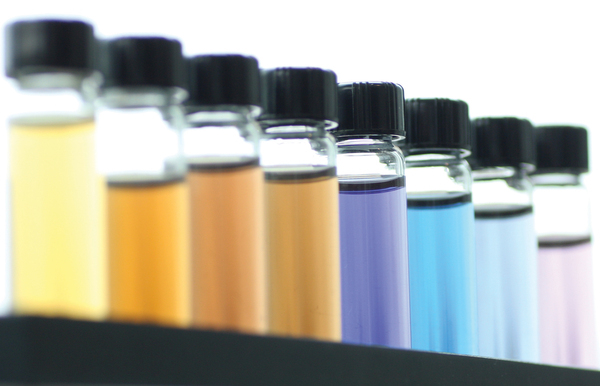 However, the artificial pigment count must be very high, so the ammonia-peroxide mix doesn’t neutralize it, as well. Because the chemical blasts open the hair, it is irreparably damaged. Your hair may be a different color, but your hair won’t be healthy enough to be styled efficiently. When the dye is swelling the cuticles of your hair, proteins and moisture are released, which is why your hair feels dry and brittle afterwards. Also, because the pH levels are raised so much, they cannot return to normal. This means that as long as your hair is colored, there will be continued protein and moisture loss. The artificial coloring will fade for the same reason, as well as the fact that tyrosine, the protein that produces the melanin responsible for naturally coloring your hair, is destroyed. This means that the artificial color has nothing to bond to. Not only does ammonia seriously damage your hair, it is potentially very harmful to you and your stylist’s health. Ammonia exposure has been shown to irritate and burn the ears, nose and throat, as well as cause severe coughing and choking. If ammonia is accidentally mixed with bleach, the results are disastrous. 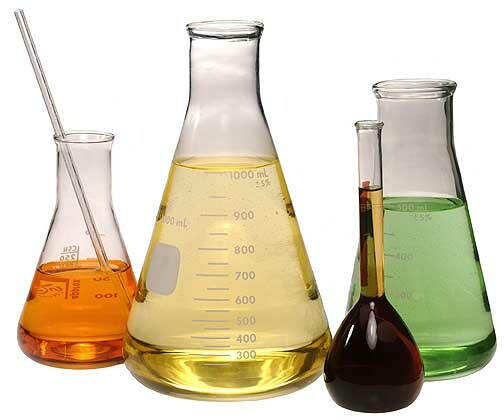 The combination of these chemicals produces toxic chlorine gas. This gas will seriously harm and possibly kill those exposed to it. There are very serious risks associated with the use of ammonia in hair salon products. Thankfully there are natural, more beneficial alternatives to ammonia based hair dyes. When you visit your salon, ask about non ammonia based permanent hair coloring.